Zaanse Schans, a lovely village on the banks of the Zaan River, in the province of North Holland, is famous for holding a collection of well-preserved historic windmills and houses dating back to 18th and 19th century. Zaanse Schans lies in the Zaan region of northern Holland, and is Western Europe’s oldest industrial area. At one point there were over 600 windmills here running at the same time. Today ten windmills, each with a unique name and purpose, remain. From Amsterdam, it’s a short drive of approximately 30 km to Zaanse Schans. The fastest way to get to Zaanse Schans is to take the 15 minutes train to Koog Zaandijk station from Amsterdam Centraal station. If you prefer to travel to Zaanse Schans by bus (which may take 30 to 40 minutes), bus 391 leaves Amsterdam Central Station twice every hour and arrives at the Zaans Museum. It’s a very special place, and it is delightful just to walk around the waterfront looking at the cute houses, tiny bridges, open fields and the windmills. The mills here are used for grinding oil, others are used to saw wood, make spices, and grind pigment for paint colours. 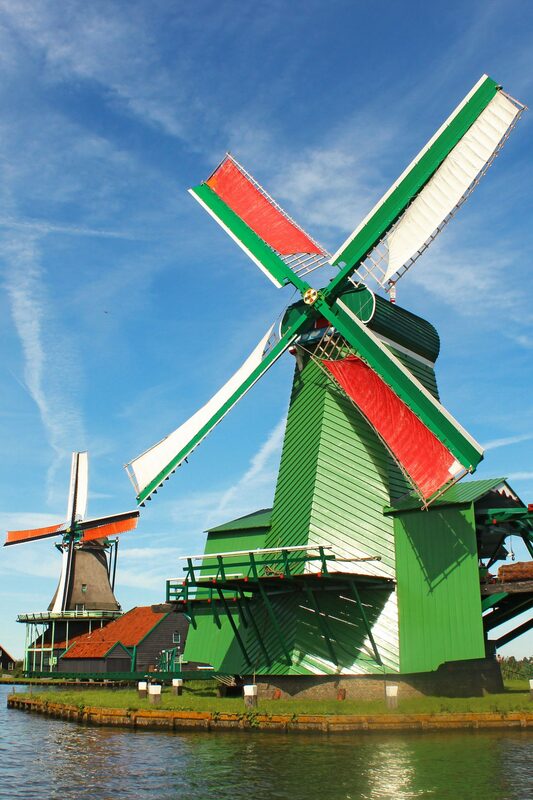 Built around the windmills are traditional style Dutch houses and small farms, complete with sheep, goats, and chickens. Feel free to have a look at my other photologs covering Amsterdam , Scottish Highlands , Edinburgh , Manchester… And you can also follow me on Instagram here ! !